With mixed emotions and a heavy heart, it is time for me to say goodbye to my alter ego of 21 years and “best friend in fur” Clutch the Bear, Mascot for the Houston Rockets. It has been my honor, granted to me in 1995 by Rockets ownership, to create and steward this character. I am grateful that my parents, Donna and Paul, both supported my decision to move across the country to Houston, to wear a teddy bear costume for the Rockets even though I was graduating with honors and with a double major in Marketing and Management. It has been quite a ride. I’ve performed over 1,000 games and have entertained at 6,000+ shows/appearances/events in Houston. I’ve had the pleasure of entertaining in most states across the country and in 11 countries around the world, including an Armed Forces Entertainment Tour for our troops in Bosnia, Kosovo & England. I took most pride in performing over 1,750 school shows in front of 1.2 million Houston area students over the years. It has been my honor to help inspire a generation of Houstonians to build a better future for themselves by focusing on the importance of their education, as well as authoring 7 children’s’ books with over a half million copies that were distributed free to Houstonian youth. I’d like to personally thank Dominic Davila, who has been with me at all games and appearances for the last 15 years. He has been my right hand man, show emcee, assistant, “translator”, “bodyguard”, and partner in hijinks. I haven’t taken a step without him by my side and I love him and thank him dearly. I’d also like to thank the hundreds upon hundreds of Rockets employees who have taken care of our favorite team over the years. I’ve gotten to work with some of the most talented, creative, and passionate people in sports, and it has been an inspiration to me. I have learned so much from you all. I would be remiss without also thanking my “furternity” of 30 NBA mascot brothers who have been like family to me. I wouldn’t have been able to do any of this without their support and creative collaboration. 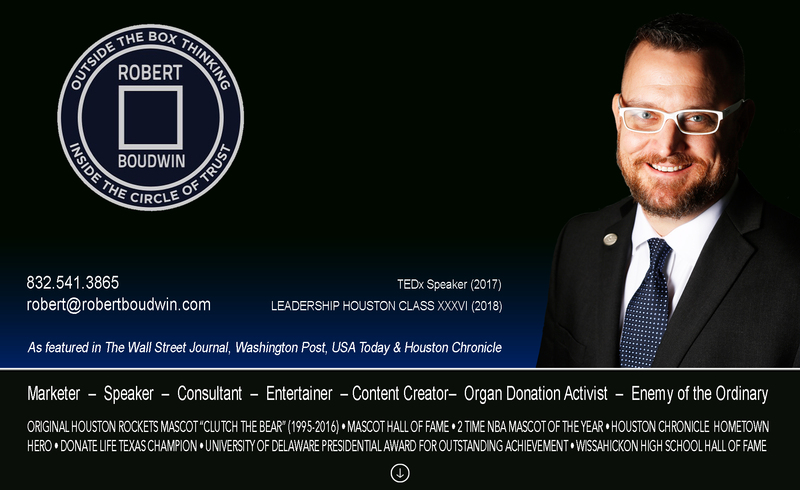 Over the last 10 years, I have been energized to participate in Houston’s leadership out of costume through non-profit service on 3 United Way Committees and Councils and currently serve on the corporate board of directors for Life Gift, The Queensbury Theatre & The Todd Krampitz Foundation. I have diligently served as an advocate for Life Gift, the Organ Procurement Organization (OPO) that services Houston. My focus has been on advocating for everyone to say YES to organ donation and have served in a marketing/promotions/emcee capacity for other organizations associated with organ donation, including Nora’s Home and Taylor’s Gift. As some of you may know my father Paul’s life was saved by an organ donor and I have run the Houston ½ Marathon twice now in full costume as Clutch to promote the cause. Sign up to be an organ donor TODAY at donatelifetexas.org. I am looking forward to my future with my loving and supportive wife Amy and our growing family (soon to be 5 kids with our second set of twins, girls this time, due literally any day now.) I will be taking a brief period of time off to focus on our baby girls’ birth and care, but am eager to pursue the next chapter of my career. I’m excited to launch a Marketing Consulting Practice with a focus on non traditional brand building strategies, outside the box thinking (which is the most inside the box way of expressing that way of thinking;), and inspirational speaking. Follow me at robertboudwin.com (which is currently under construction) to stay tuned for the official launch! Finally, I wish to thank all the AMAZINGLY PASSIONATE Rockets Fans who have laughed and cheered with me over the last 2 decades, and have helped me achieve my claim to fame… which is I’ve hugged more Houstonians than anyone on the planet! I will continue to cheer with you for our favorite team just not from inside the costume. I am excited to see what Clutch holds for us in the future, as he can be a bit unpredictable, as you all well know! Here’s to a 3rd NBA World Championship for the Rockets in the near future! THANK YOU HOUSTON!!! Next Next post: Thanks ABC13…and…THANKS HOUSTON!! !